Caloptilia robustella Jäckh, 1972. Atti Acad. Sci. Torino 106 (4): 552, fig'd. Leaf miner: Initially in short gallery becoming a blotch in the leaf. Later in up to three cones at the edge of the leaf (UKMoths). 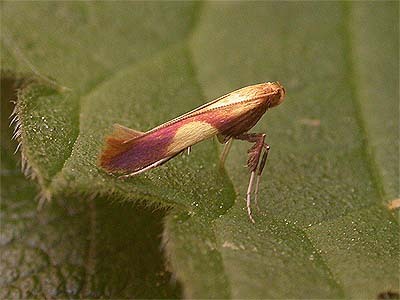 The mines and cones are the same as for Caloptilia alchimiella and the moth needs to be bred out to confirm identity (British leafminers). Mine indistinguishable from those of Caloptilia alchimiella (Bladmineerders van Europa). The pupa forms in a cocoon under a turned over leaf edge (British leafminers). Time of year - larvae: May - July, September - October (British leafminers). Time of year - adults: A number of generations, any time between April and November (UKMoths). Distribution in Great Britain and Ireland: Britain including Hampshire (Fleet) (British leafminers), Bedford (Studham) (UKMoths); Bedfordshire, Buckinghamshire, Caernarvonshire, Cambridgeshire, Carmarthenshire, Denbighshire, Derbyshire, Dorset, East Cornwall, East Kent, East Norfolk, East Suffolk, East Sussex, Glamorgan, Hertfordshire, Huntingdonshire, Isle of Wight, Leicestershire, Middlesex, Monmouthshire, North Devon, North Essex, North Hampshire, North Somerset, Oxfordshire, Shropshire, South Aberdeenshire, South Devon, South Hampshire, South Lancashire, South Wiltshire, South-west Yorkshire, Stafford, Surrey, Warwickshire, West Gloucestershire, West Norfolk, West Suffolk and Worcestershire (NBN Atlas). See also British leafminers distribution map. Distribution elsewhere: Widespread in continental Europe including Austria, Balearic Is., Belgium, Canary Is., Czech Republic, Danish mainland, Estonia, Finland, French mainland, Germany, Hungary, Italian mainland, Latvia, Lithuania, Luxembourg, Norwegian mainland, Poland, Romania, Russia - Central, Sardinia, Sicily, Slovakia, Spanish mainland, Sweden, Switzerland and The Netherlands (Karsholt and van Nieukerken in Fauna Europaea).